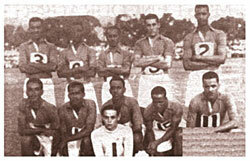 Jamaica's first international appearance was against their Caribbean neighbors Haiti in 1925. They were invited to the French-speaking Caribbean island by Andre Chevalon, president of the then United Sporting Society and it was for a three-match series between the two countries. Jamaica won all three games by 1-0, 2-1 and 3-0. The following year Jamaica hosted their Haitians counterparts at Sabina Park and won by 6-0. The Haitians remained frequent opponents and it was not until 1932 that their run of defeats was broken with a 4-1 home win in Port-au-Prince. 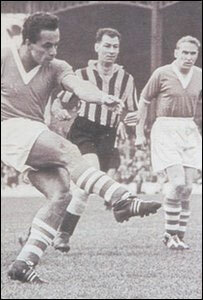 Between 1925 and when Jamaica gained it's independence 1962, Jamaica had regular games with Trinidad and Tobago, Haiti, Cuba and clubs like Racing and Violette from Haiti, Corinthians of Britain, the Tigers from Argentina, and even a series of matches with a Caribbean ALL Stars team in 1952. The Caribbean All Stars team included such notables as Michael (The Ruin) Kruin from Suriname and also representing Jamaica were Lindy Delapenha and Gillie Heron. The four games were shared equally with Jamaica winning the second 2-1 and the fourth 1-0 and the All Stars winning the first 5-1 and the third 1-O. Those friendly international games were the start of Jamaica's football quest with most of the home matches being played at Sabina Park. Many clubs were established during this time including Kensington, Melbourne, Kingston, Lucas and St. George's Old Boys, thus providing the talent Jamaica needed at the time. In 1965 under the leadership of Brazilian coach Jorge Penna, Jamaica made its first attempt at World Cup qualifying. This was for the 1966 World Cup finals in England. The preliminary group included Cuba, the Netherlands Antilles, and Jamaica. Jamaica's first game was against Cuba which they won 2-0 at Jamaica's National Stadium. In the qualifying match against the Netherlands Antilles, Jamaica also had a 2-0 victory with both goals coming. In the away games Jamaica was held to a goaless draw with the Netherlands Antilles and suffered a 2-1 defeat to Cuba. Jamaica then advanced to the final group of 3 which included Costa Rica and Mexico. The winner of this group would represent the CONCACAF region. Jamaica lost at home to Mexico 3-2 and in the return leg in Mexico City the high altitude proved to much for the Jamaicans and they were defeated 8-0. Jamaica lost 7-0 to Costa Rica in their first encounter and had a 1-1 tie when they played at home. In 1968 coach George Hamilton took leadership as Jamaica made an attempt to qualify for the 1970 World Cup Finals in Mexico. 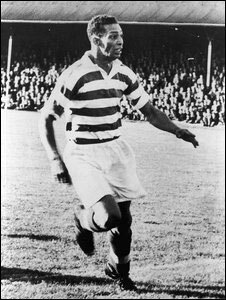 Jamaica had only a couple remaining players from the previous World Cup team and had to rebuild because most of the players had retired or migrated to North America and England. Jamaica lost all of their qualifying games in that year. Jamaica's participation in the 1974 World Cup elimination saw the suspension of 17 players on the team because of poor behavior on a tour to Bermuda. Jamaica withdrew from the elimination in order to restructure their team. The 1978 Word Cup in Argentina saw Jamaica playing Cuba and losing 3-1 at the National Stadium and then 2-0 in Havana Cuba. Jamaica did not qualify. In 1982 Jamaica did not make an attempt for the World Cup Final set in Spain due to insufficient funds and a poorly prepared team. Jamaica did not participate in the 1986 World Cup because suspension for affiliation fees that was due to FIFA. In preparation for the 1990 World Cup with coach Jeffery Maxwell Jamaica won both preliminary games against Puerto Rico 1-0 in Jamaica and 2-0 at Puerto Rico. The U,S, were the next opponents and was held to a goaless draw. The return leg in the U.S. saw Jamaica losing 5-1 brining an end to their qualifying attempt. The United States hosted the World Cup 1994. In qualifying Jamaica beat Puerto Rico 2-1 and was then faced Bermuda, Canada, and El Salvador from which two teams would advance to the final round. Jamaica tied 1-1 with Canada and Bermuda and then lost 2-0 to El Salvador, 1-0 to Canada, 2-1 to El Salvador. Jamaica then beat Bermuda 3-2 but did not qualify. 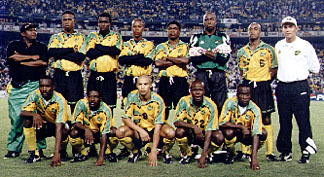 Under Brazilian Professor Rene Simones and National coach Carl Brown, the Jamaican team has become a "Powerhouse" in the Caribbean region and received "Best Mover" award by FIFA in 1996. Their ranking continues to change as they get closer to the finals on their road to France. Jamaica made history by becoming the first English speaking country from the Caribbean to ever qualify for the world cu p finals.